The lone hearse at the Wesley Church in Mysuru city is now a thing of the past. As there are more comfortable ways to transport coffins these days, the hearse lies in a remote corner biting the dust. Though it is no more in use, this antique piece carries a rich legacy and is awaiting a new lease of life. The term hearse comes from the Middle English term ‘hearse’ meaning a type of candelabra often placed on top of a coffin. Around the 17th century, people referred it to the horse-drawn carriages that conveyed the casket to the burial site in a procession. They were originally used as a public transportation but later evolved to be a funeral carriage vehicle. 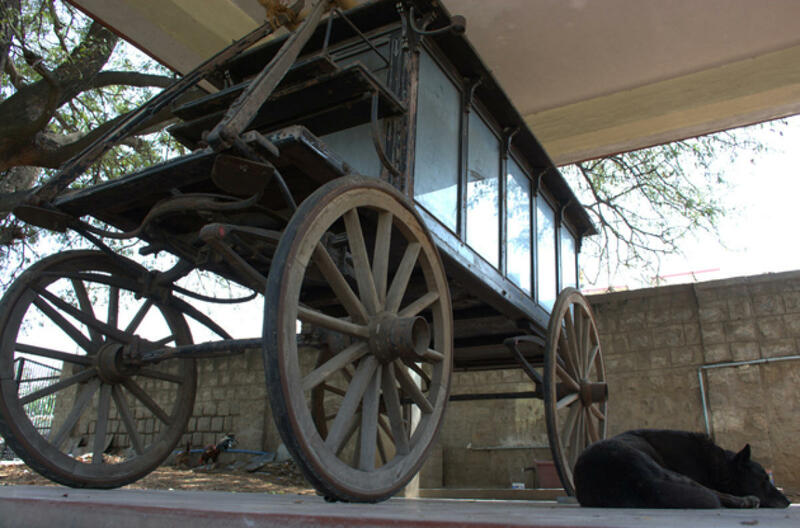 Many in the city are unaware that the cultural capital of Karnataka hosts an antique hearse. Surviving records indicate that it could be a 300-year-old hearse. This hearse is beautifully built using teak wood, 3.5 feet in height, 8 feet in length and is 3.5 feet in width. The space between its bottom and wheels is 8 feet. The hearse looks spectacular due to its size, elaborate bodywork and ornate detailing. It is built to be pulled by a pair of horses. This wooden hearse has five columns with ornate, hand-carved corbels, glass panels and doors. Four-spoke wheels are too made of wood with chrome hubcaps. A brake stick on the right side of the coachman’s bench controls the brake pedals. The interior has heavy, black drapes with tasselled tiebacks. The floor and the roof are laminated with wood and roller bars. The roof is leather and the coachman’s bench has chrome fittings. Two candle lamp posts are affixed on either side of the driver’s seat. George William Sawday, a Christian missionary, was instrumental in setting up of Kannada churches, hospitals, schools and colleges in the erstwhile Mysore state and one of his contributions was the Wesleyan Methodist Church. Sawday had cordial relations with the Maharaja who donated the hearse to the soldiers of St Bartholomew’s Church. Later, Nalwadi Krishnaraja Wadiyar and Jayachamarajendra Wadiyar donated it to Wesley Church in 1868. The gift reflects the secular attitude towards other faith. Siddu, a cemetery caretaker, says that the hearse was continuously in service for several years. Rituals involved in Christian funerals would be incomplete without this hearse a century ago. “The hearse was in great demand as there were no other better means to transport coffins,” Jayaprakash Hanchan, a member of the church recalls. Back in days, the hearse would be pulled by a pair of white horses. The coachman would be clad in an attire specially meant for the funeral. The hearse would be decorated with a wide variety of flowers. When it was driven towards the cemetery, people would pay their respect by pausing for a moment on both sides of roads. The horse-drawn funeral hearse created an additional sense of occasion. It definitely allowed the family and loved ones to say their goodbyes in a personal and caring manner, explains Reverend Grateful Jayashekar. Hanchan recalls that the hearse was used extensively when he was a child. According to K V Vijay Kumar, a church member, charge of Rs 200 or Rs 500 was fixed for the hearse service. 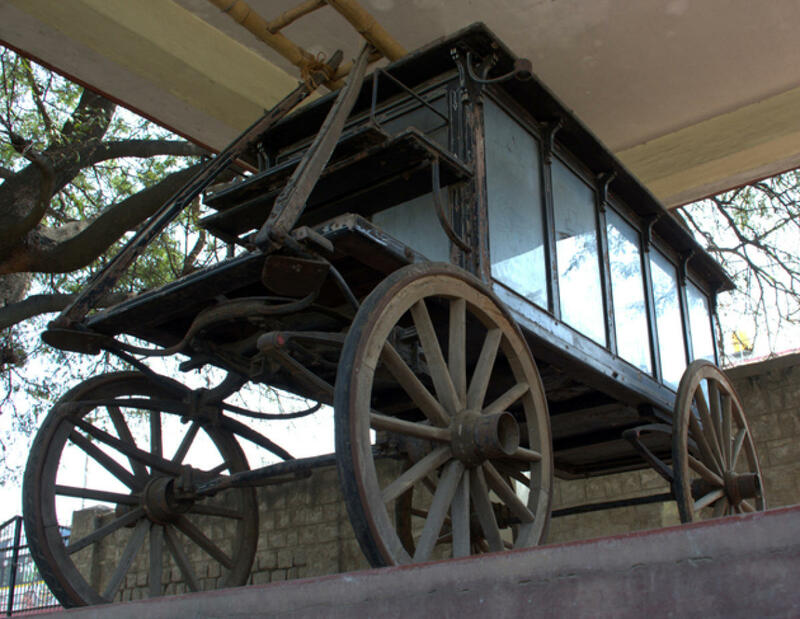 Hence, the horse-drawn hearse started losing its relevance once the Mysore City Corporation introduced a free facility to transport corpses. “These days even tongas are a thing of the past. The city has a few tongas and the tonga owners charge high. As people don’t want to shell out more money, they prefer against using the corporation hearse for the funeral service,” he points out. It was a typical funeral conveyance until recently in the city. This antique piece will be made available after minor repairs are executed, says Jayashekar.